Birds can be the cause of major damage, they deface buildings, signs, drop feathers, nesting materials and droppings. Any combination of these factors can affect workplace production. Bird droppings and infestations from birds can (and do) cause major headaches for both home and business owners. For business owners it can affect productivity and employee satisfaction. From that point alone, it’s easy to see why bird infestations are a serious issue and cause major problems for business owners. Damage and infestations however, can appear in other areas that you would not think likely to affect workplace harmony and satisfaction. Fonterra found themselves in one such situation. 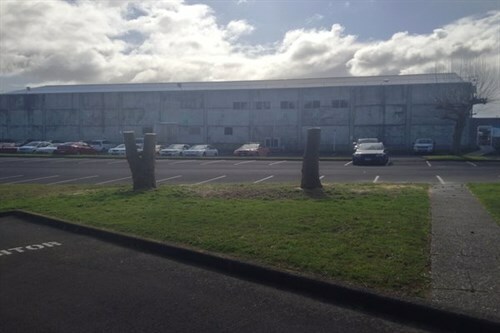 Apart from being a major annoyance for the employees at Fonterra, it was a serious problem that long term could cause costly cleaning bills, repair or replacement. Fonterra needed to find a solution for their employees and this is where Unqiue Services saved the day. Two trees on site had become the harbouring ground for a mass of nesting birds. While this typically would not require attention, the fact that staff car parking was directly below caused a huge issue as faeces were dropping down and fouling or damaging employee vehicles, leading to major annoyance for staff and adding costs and time on cleaning and repair. It goes to show that bird damage in a business context, not only has the potential to affect direct production methods, but also indirectly through employee dissatisfaction. And a company that recognises the importance of employee satisfaction in more areas than a direct work related situation is a company that knows how to take care of their own. So as a responsible and understanding company Fonterra requested our help to resolve the issue. So how did we resolve it? At Unique Services, we don’t want to, nor do we ever eliminate birds – we aim to deter where possible. Within our team we are fortunate to have the expertise of Mark Pickstone who with more than 10 years experience in horticulture and arboriculture, was the man to take charge on the day and lead our team of four. While deterrents are easily applied and effective in building situations, a tree on the other hand, provides an unstable platform whereby deterrents are no longer effective. Given that the site has a number of trees in areas where bird activity does not have any detrimental effect on people, property or place, then the option to reduce the tree’s stature was the best and most effective solution. Our fully dedicated and trained team took the first step to remove some of the main limbs to balance the weight of the tree. From here Mark was able to safely perform the felling of the upper half of the tree. 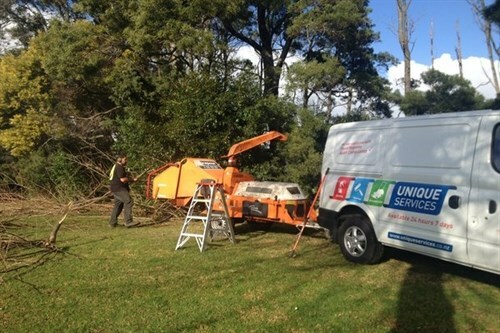 Once the tree was on the ground it was de-limbed and fed through the chipper. With four people on the job, the three main trunks were down, mulched and the site cleaned within four hours. Even within such a fast time-frame the whole process went very smoothly and the job was completed efficiently and to a high standard, the outcome of which was a very happy client and very happy staff. To apply a similar focus on employee satisfaction where bird infestations or any other health, hygiene or grounds issue is plaguing your productivity, simply give our team a call. Experienced, skilled and qualified in industrial cleaning, grounds and building maintenance and food safety cleaning, Unique Services is your go to commercial solution. Be it a major issue, a growing concern or a minor annoyance, we have the plan and procedures to see you through.